Our explorers crash landed, with no way to get back for sure, plus the future is encroaching upon the past in a huge way. So, the crew is basically dealing with enough to make their heads explode. 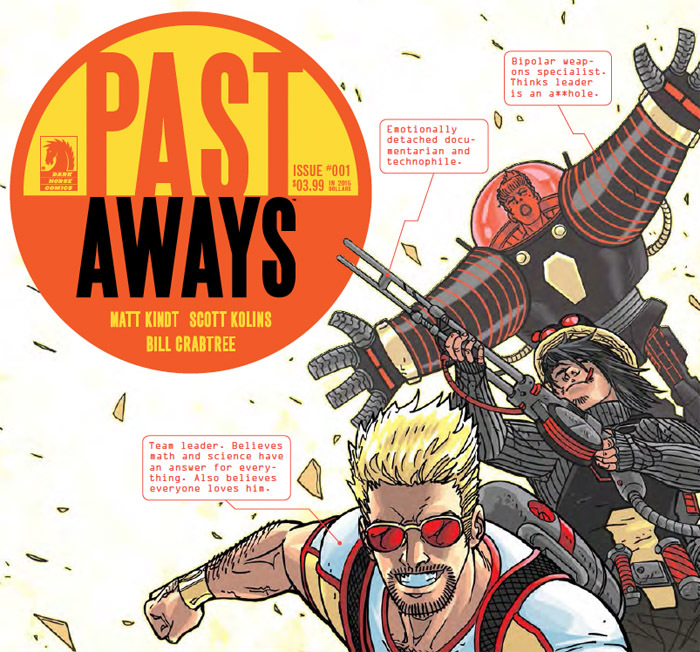 Matt Kindt’s script is relentlessly good as he introduces characters and juggles all sorts of sticky time travel issues. Scott Kolins provides us with pitch perfect art with a light and vibrant touch. Based on this first issue, it’s safe to say that we truly have here something special. The layers of complexity that are being meted out are flowing nicely. And never underestimate the value of a wicked sense of humor since that seems to be a good part of the glue that keeps this all together. With more than a million years of evolution separating our main characters from, well, us, you might expect them to be more…evolved. That is hardly the case. They do have an assortment of very cool gadgets though. And they feel sorry for those struggling in 2015 amid never-ending conflicts and basic lack of progress. And yet, they don’t seem all that different from us. They can be just as petty, impatient, and even snarky. Oh, but there are differences. And those differences could lead to mass destruction. Wow. This is one of the most thought-provoking and just plain fun comics you’re likely to find now. 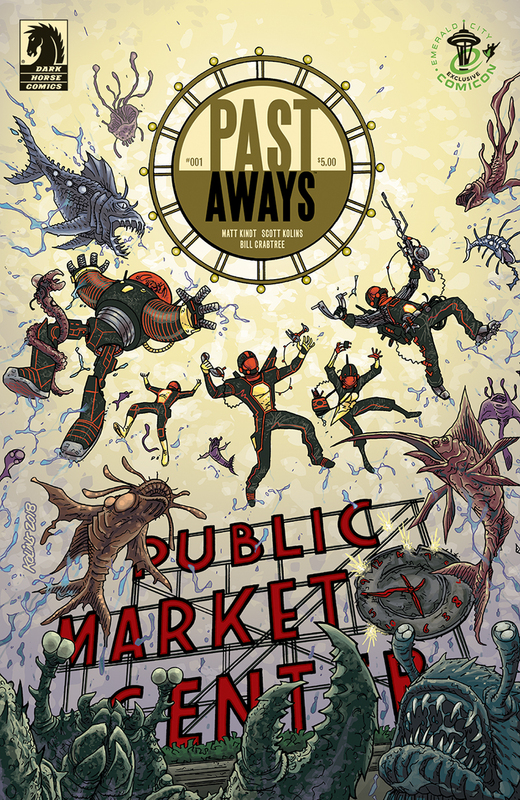 PAST AWAYS #1 is available as of March 25. For more details, visit our friends at Dark Horse Comics right here. Snarky and capable of mass destruction? Sounds like the present to me, Henry. Ha, ha, in more ways than one. I must be ahead of my time. I traded in my smartphone for an old style cellular after I got an I-pad. I already felt I was getting brain damage from too much smart phone. A SP and I-pad, well that’s just heading into lobotomy territory. Sounds like a cool ride this comic. Always dig your take on the scene man! Yep, you’ve got to show them who is in control.